Our Custom Hurricane Glasses are a great giveaway for promotions, special events, and much more. Each Hurricane Glass is Kiln-Fired at up to 1200 Degrees for a durable and a long-lasting imprint. 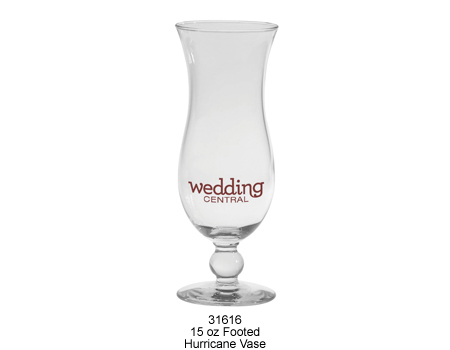 Pricing for Custom Hurricane Glasses – Call 1-800-233-0828 for more info or to order! 31616 15 oz Footed Hurricane Glass $3.96 $3.56 $3.41 $3.30 $3.20 $2.98 1-5/16" 3-3/16"
It's easy to have your own Custom Imprinted Glass Hurricanes. Simply call 1-800-233-0828 and submit your camera-ready artwork to graphics@kardwell.com (you can also mail your art). The minimum order is just 72 Glasses and production time is about 3 to 4 weeks. Rush delivery is available.